As I currently dream of warmer weather, I put together a list of obvious spring wardrobe essentials. 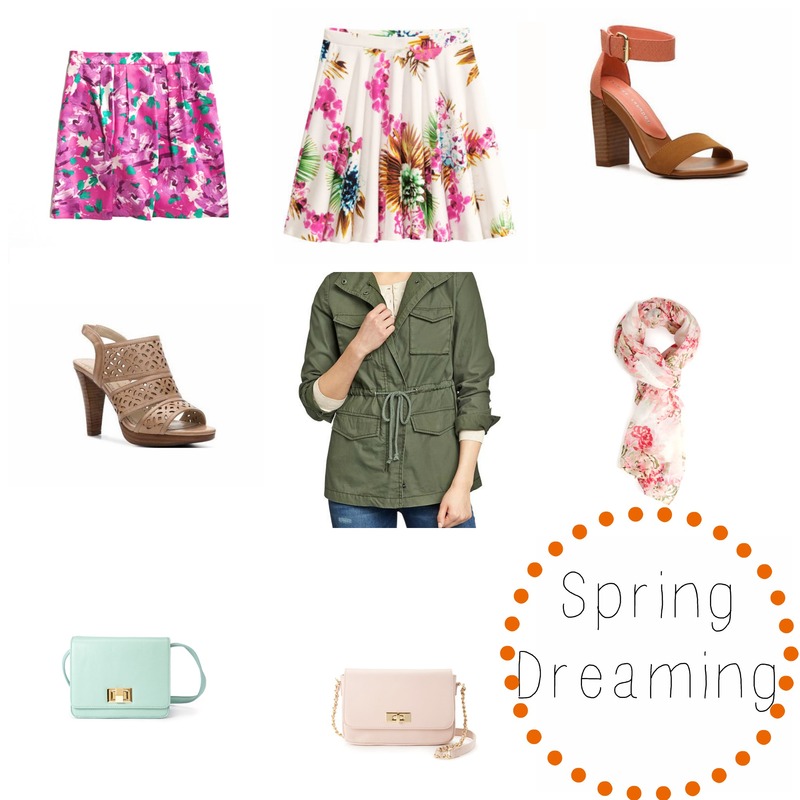 Floral prints, pastels and sandals are no brainers when it comes to spring outfits, but I found some items that are not only affordable, but cute! I know California doesn’t really have winter, but this girl is still wishing for spring to come sooner. I’m a tad tired of wearing sweaters and boots. I can only imagine how others feel with the crazy weather in the east!! I don’t have anything floral print! For shame. Since I can’t really wear flats without my feet hurting (read more here) I am looking for some sandals with a heel. I don’t want anything too high because then I won’t be comfortable, but anything 3 inches and under should be fine. *Note: heels that are four inches high, but with a one-inch platform feel like only 3 inches on your feet. I have wanted an army green utility jacket since last year. I would love to add a floral scarf to my closet and wear with striped shirts! Stripes and florals are a great combination. Colorful crossbody purses are my favorite and a simple way to freshen up your closet. When I don’t feel like shopping or spending money, I buy an accessory that I can use through the season and it will keep me from wanting to shop!